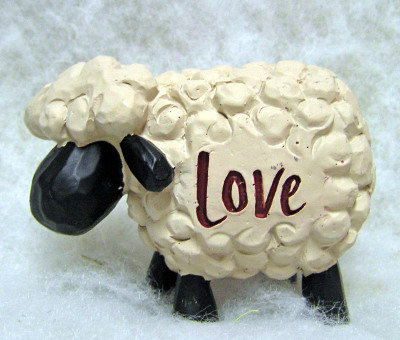 These adorable resin sheep come in three styles: "Love" (shown), "Joy" and "Peace" (click on photo to see these options). They have puffy, fluffy coats with black face, ears, and legs. They measure 2 x 3 1/2 x 2. 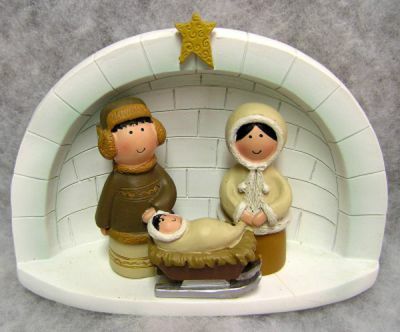 An igloo is the setting for this cute resin nativity. It features Mary and Joseph with warm coats and hoods and little Baby Jesus in a manger sled wrapped in a fleece lined blanket. It measures 5 x 6 x 3. 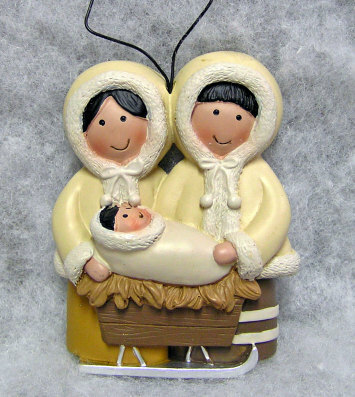 This unique resin ornament shows an arctic nativity. 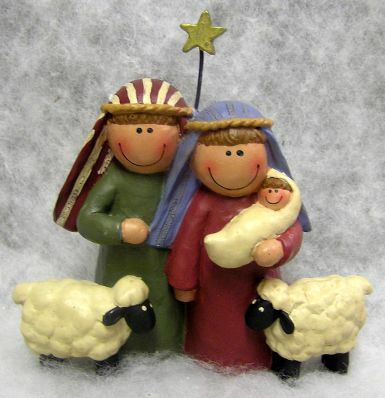 It features Mary and Joseph with their furry hooded jackets and Baby Jesus wrapped up warmly and in a manger sled. It measures 3 x 2 x 1 + wire hanger. Mary, Joseph, Baby Jesus and two sheep are featured in this resin nativity scene. They are all smiling and there is a star above them. It measures 4 1/2 x 4 1/2 x 2. 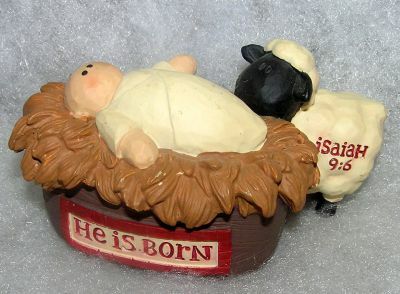 "HE IS BORN" is painted on the side of this resin manger holding Baby Jesus. 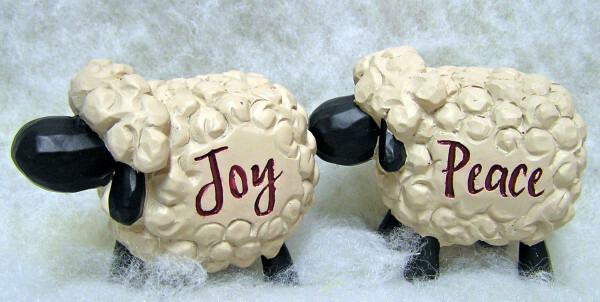 A little sheep is watching over Jesus and he has Isaiah 9:6 on him. It measures 2 x 3 1/2 x 2 1/2. 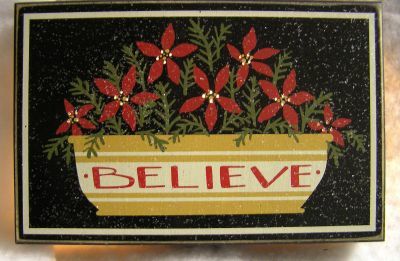 This wooden lightbox has a bowl filled with poinsettias painted on it. It says "BELIEVE" on the bowl and has holes in the center of each of the flowers to let the light shine through. It measures 7 x 10 x 2. 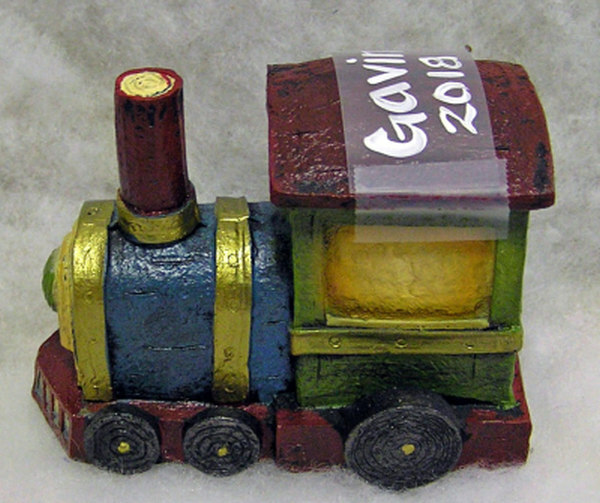 This ceramic train has a variety of colors and can be personalized on the roof. It measures 3 x 4 x 2 1/2. 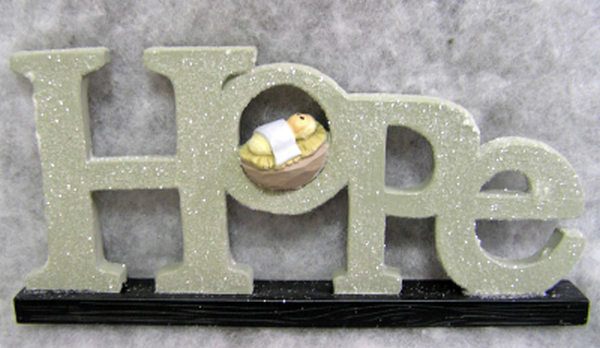 "H-O-P-E" is spelled out in this resin item. The letters have a sparkly finish and are mounted on a black base. 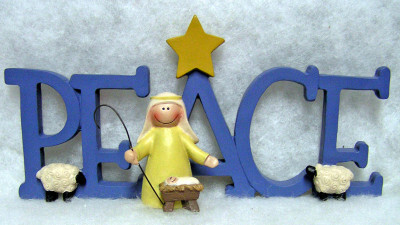 Baby Jesus is resting in a manger inside the letter "O". It measures 4 x 8 x 1. This unique resin nativity features separate letters of the word BELIEVE. Each letter has a part of the nativity on it. The B, E, and L have the wise men, the I has Mary, Joseph and Baby Jesus in the manger with a star on top, the E has a shepherd, the V has three sheep, and the E has angel on the top. It measures 2 x 8 x 2. This beautiful porcelain old fashioned santa has little wire glasses and is sitting on top of a deer. 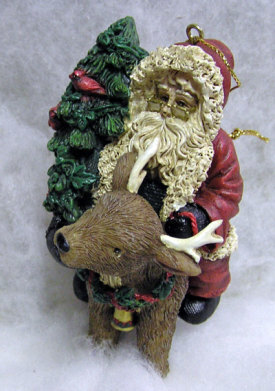 The deer has antlers and a bell and greens around his neck. 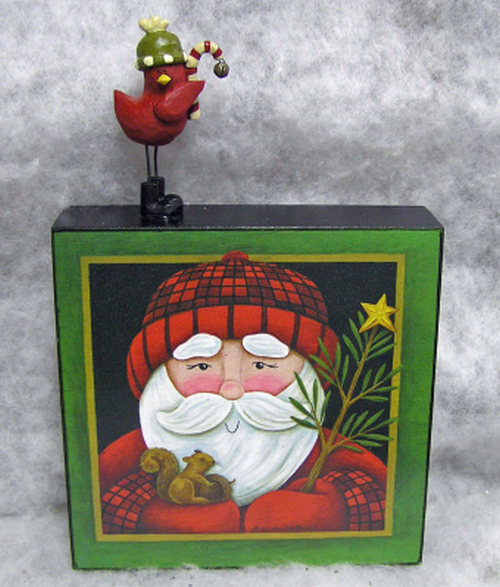 There is a pine tree beside him that has birds sitting on its branches. It measures 4 x 3 1/2 x 3. This wooden heart features cut out santa, snowman, trees and presents. 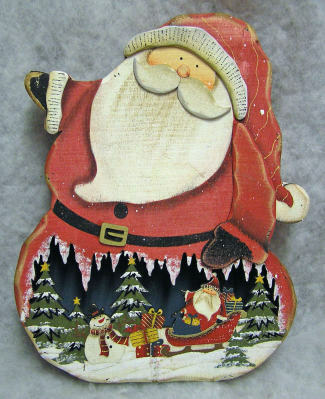 It also has a separate wooden border and a jute hanger. It can be personalized. It measures 12 X 13 X 1. Mary is kneeling by the baby Jesus in this resin creation. 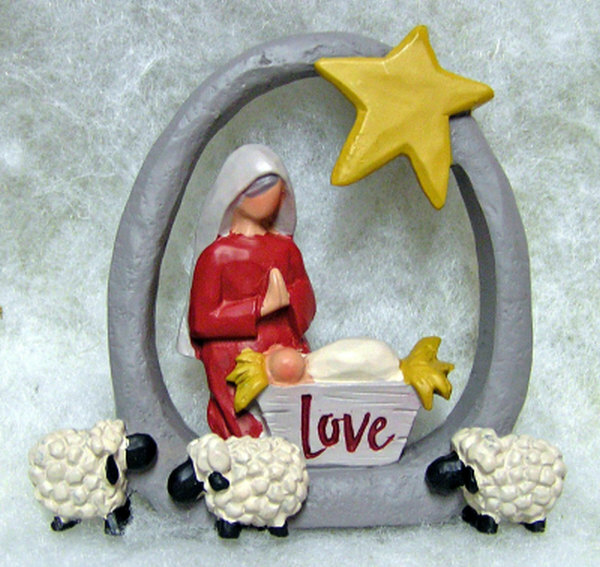 It says "LOVE" on the side of the manger, has three little sheep watching the baby, and there is a star overhead. It measures 3 3/4 x 3 3/4 x 1. This beautiful resin item spells out the work "P-E-A-C-E". 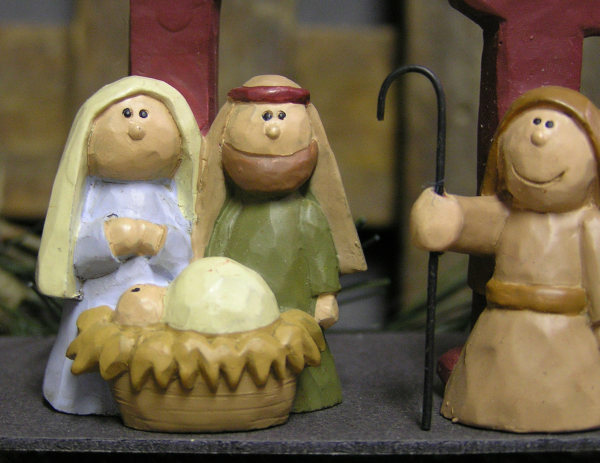 It features a shepherd with a wire staff standing at the manger. There are also 2 sheep and a star on top of the "A". It measures 4 x 8 x 2. This unique wooden box features a print of Santa with a squirrel and a tree branch with star. It has a resin tree on the top with little Christmas lights. It can be personalized. It measures 8 1/2 x 6 x 1 1/2.